We are among the well known companies in the field of manufacturing, supplying, exporting and wholesaling of Stand Type Concrete Mixer Machines. 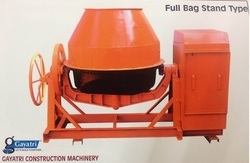 Such as Winch Machine (Stand Type), Full Bag Mixer Machine (Stand Type). These machines have great performance level and are highly used in industries. These are available at cost effective prices to suit the pocket requirement of our leading customers. Our company is among the most trusted companies in the manufacture, supply, export and wholesale of Full Bag Mixer Machine. These are used in manual loading applications. These mixer machines are highly equipped by latest and advanced technologies. Besides, these are highly known for their smooth functioning and long service life. These have high grade raw material and are available at reasonable price. Looking for Stand Type Concrete Mixer Machines ?